WELCOME to the June Lake Loop Historical Society Website. The JLLHS was founded in 2009 to honor the history of the community of the June Lake Loop in the Eastern Sierra of California. The Loop's earliest known visitors and inhabitants were the Kutzadika'a people. When explorers the likes of Jedediah Strong Smith and Joseph Reddeford Walker passed through the Eastern Sierra in the early 19th century, they took little note of this unique canyon at the southern rim of the Mono Basin. Although recognized for its natural beauty and water resources, the miners and ranchers of the Bodie Gold Rush era found no reason to settle the area either. Finally though, with the decline of the nearby mining communities and the interest in hydorelectric energy to supply faraway cities, a project was established to build a generation plant and three high elevation reservoiirs upstream from Silver Lake. The Rush Creek Power Station was established in 1915, and shortly thereafter. one of its employees, Roy Carson, established a fishing camp on Silver Lake. 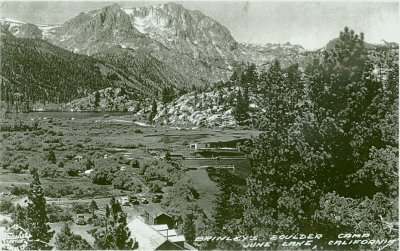 By the mid 1920's, and with the building of a trans-Sierra highway into Yosemite via Tioga Pass, June Lake became a popular stop for Auto Tours. Many famous personalities were known to visit the loop and a variety of shops and resorts sprung up to accommodate visitors. In the 1930's the City of Los Angeles arrived in the area to build the Grant Lake Dam and Mono Craters Tunnel, which would divert water from the Mono Basin into the acqueduct. With the influx of workers and industrial activity the town boomed, becoming a full service community and by 1940 there was even a ski area established. Unfortunately due to the water diversions, the agricultural activities of the Mono Basin;s numerous ranches were destined to end. In the ensuing decades the town of Mammoth Lakes to the south has taken over the role of the most populous and prominent Mono community: but the June Lake Loop, with its rich history, remains resilient and has continued to fulfill the recreational needs of many generations. 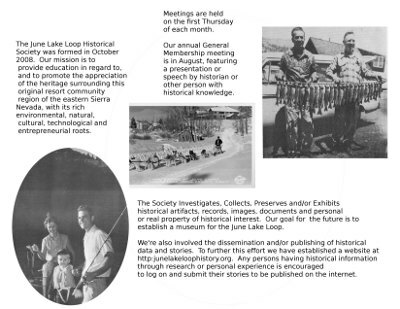 The June Lake Loop Historical Society welcomes any contributions relating to the preservation of our history. We invite you to attend our meetings and programs where the local history is discussed. It is also our aim to establish a muserum to display area artifacts, and to preserve and memorialize local historic sites. Thanks for your interest in the history of the June Lake Loop. Thanks to the County of Mono Board of Supervisors and Counsel Marshall Rudolf for legal assistance.and support. the June Lake Loop Historical Society is organized as a non-profit corporation in the State of California, and has been granted tax-exempt status by the Internal Revenue Service under section 501(c)-3. At tonight's meeting of the June Lake Loop Historical Society it was announced that a letter of acceptance was received from the Internal Revenue Service, granting the June Lake Loop Historical Society a tax-exempt, non profit organization under section 401(c)3. Contributors may wish to note that the effective date of this status is made retroactive to our incorporation in August of 2009. The Society owes a debt of gratitude to Mono County Counsel Marshall Rudolph, and the Mono County Board of Supervisors for seed funding and support through resources to make our 501(c)3 status possible. 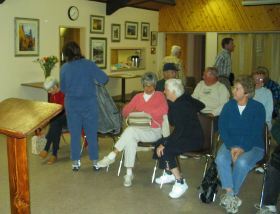 The newly formed Society held its first General Annual Meeting on August 6 at the June Lake Community Center. About thirty interested persons were in attendance as President Dan Roberts gave a welcome address and a brief overview of the origins of the June Lake community. The program consisted of Ron Dunn, longtime summer resident at Silver Lake, who gave a talk on his experiences in the 1940's when there was gambling in June Lake and he and his father were the operators of a slot machine business. Then Igor Vorobyoff spoke about the natural history of the area. 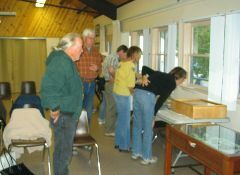 Several individuals joined the Society as members and there were some displays of old photos and artifacts, including a mounted Steelhead Trout caught in the twenties by renowned area photographer Burton Frasher. The evening ended with refreshments and sharing of many stories of the past by the participants.